Discussion in 'Indian Air Force' started by Gessler, Sep 3, 2017. 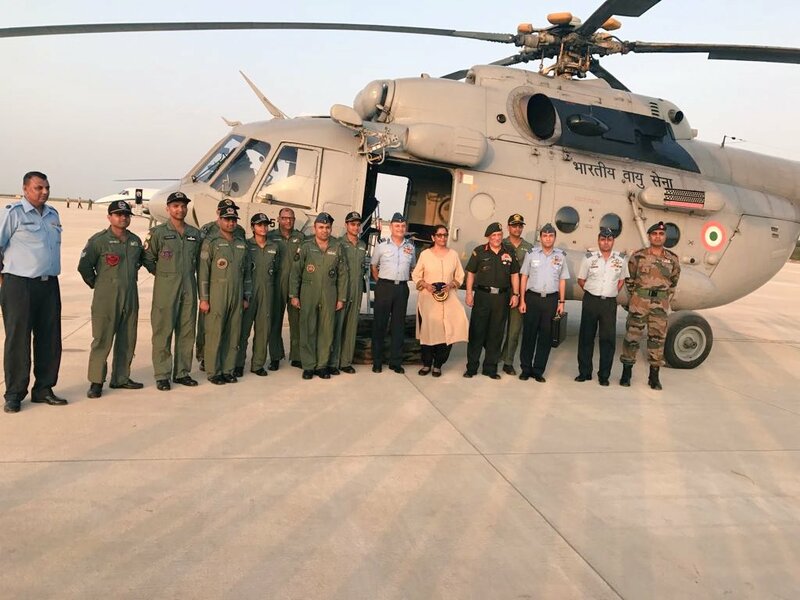 We have a dedicated sticky thread for Attack Helicopters, now we have one for Transport helos as well - post all news & discussions regarding the existing Mi-17, Mi-26, Dhruv, AW-101, Chetak, Cheetah (and variants) as well as upcoming acquisitions like the CH-47F Chinook here. GSLV Mk III, Bloom 17, Sancho and 5 others like this. Bali78, GSLV Mk III, Sahil ecclstone and 11 others like this. Chinooks are a freak helicopter. They're going to last a century. Has anybody reliable sources for the numbers of Mi 8 and Mi 17 in service or on order? Bali78, GSLV Mk III, Abingdonboy and 3 others like this. Wasn't there talk of ordering another 50+ V5s? There are/were close to 250 legacy Mi-8/17 in service so the V5 orders are not enough. I assume as the "newer" Mi-17s come to the end of their lives more batch orders for V5s will be placed. A HUGE opportunity thrown away here, 150-200 V5s being shipped entirely from Russia with ZERO local production, how often do these kind of quantities exist? India could've got itself into the global Mi-8/17 supply chain, created a nice ecosystem for itself and even explored 3rd party exports but instead, 100% off the shelf orders. Only today is "Make in India" being discussed in the mainstream but where was the effort when the V5 orders were being considered? The batch orders make me VERY suspicious, 50-70 unit orders placed within a few months of one another (not the years and years gap one normally sees) almost as if to slide this under the radar; a 150 unit order in one go would have been a large news item and would likely have raised questions as to why no local production was part of the deal (this was during the same period MMRCA was playing out) but instead the second batch was stated to be a "follow on" to the first deal which seems far more palatable. Look at every large(ish) deal since- make in India has been a factor but this deal remains an anomoly despite being one of the largest (in sheer volume) in recent times. Thankfully the IMRH will (hopefully) address this nonsense once and for all and close another area where Indians can be hoodwinked and robbed by foreign OEMs (particuarly the Russians). GSLV Mk III, surya kiran, Sancho and 2 others like this. GSLV Mk III, Abingdonboy, nik141993 and 1 other person like this. The IA too has conveyed that service-induction of the Ka-226T is a no-go. Hence, to mollify the Ruskies, an additional tranche of about 60 Mi-17V-5s will be ordered in future. Sancho and Blackjay like this. That doesn't make sense because it was shortlisted. He claims IAF and IA had said no, but didn't gave any reason why as far as I have seen right? Well, wait and see. Ka-226 were always a no go. With LUH coming in, I do not understand why the Ka-226 was being pushed forward by GoI? Yes we have a requirement of a Light Heli, and LUH fits the bill! Normally I am out with guns after DPSUs, but am impressed by HAL's Helicopters .. there have been teething problem, but that is normal with any system introduced. Let's hope HAL is able to get it's act together on this. Bali78, GSLV Mk III, Abingdonboy and 2 others like this. My thoughts exactly, it has always struck me as odd how the GoI pushed for the Ka-226. It has been speculated this was part of a secret payment to the Russians for strategic TOT. Sathya and Hellfire like this. Could have been. I am sure LUH will do well, HAL has proven itself at least in the rotary wing segment. GSLV Mk III and Abingdonboy like this. HAL LUH has VERY good prospects IMHO, I have little doubt in my mind that it will be another succes story for the services and HAL. It is really going to prove a game changer in the heights of Siachin and the NE where the Cheetahs are currently limping along. GSLV Mk III, Hellfire and migflug like this.